Comfort food sounded good on this dreary November day. It was a cold, windy and rainy day and I was in the mood to make something that was stick-to-the-ribs kind of filling. I wanted to try and keep the dish more geared to healthy and I think I succeeded to a degree. There is still some carbs in the crust and I used meat in this Pot Pie because I was craving it after not having meat for a few days. 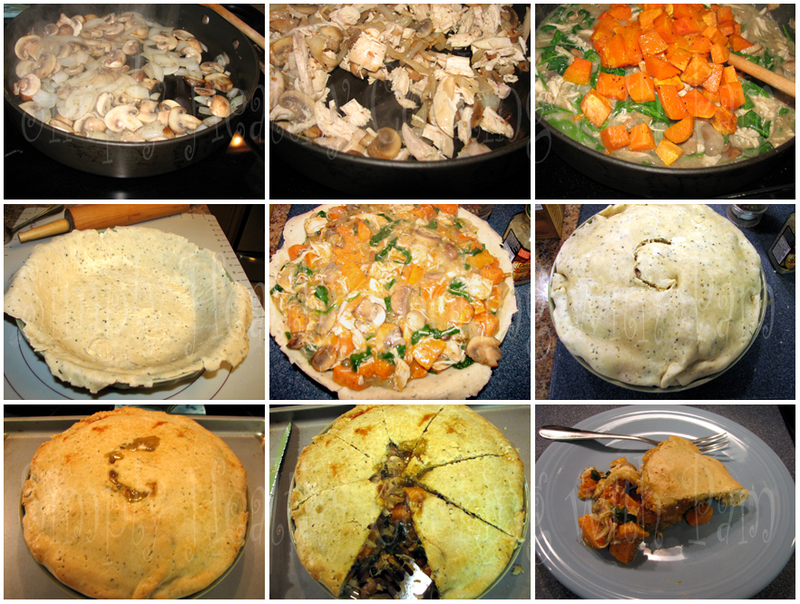 I did a different twist to this Pot Pie – using roasted sweet potatoes and butternut squash, baby spinach, chicken and mushrooms and the flavors really came through. Serve this Pot Pie with a nice green salad and you have an awesome meal. Enjoy! Preheat oven to 400 degrees. Single layer chopped butternut squash and sweet potato on a cookie sheet or stone and coat pieces with 2 tablespoons of olive oil and season with kosher salt and fresh cracked pepper. Toss and coat well. Put in oven and cook for about 20 to 25 minutes until squash and sweet potato is cooked through. Remove from oven and set aside. In a food processor, add the flour, salt, olive oil and olive oil. Pulsate in food processor until mixture resembles coarse crumbs. Add ice cold water 1 tablespoon at a time until the mixture comes together looking like a semi ball / crumbs. On a hard surface, dump out the flour mixture and push mixture gently with hands until a large disc forms. Cut disc in 2 and wrap with saran wrap and put in refrigerator for a good hour until pie crust is cold and chilled well. Turn down the oven heat from 400 degrees to 350 degrees. 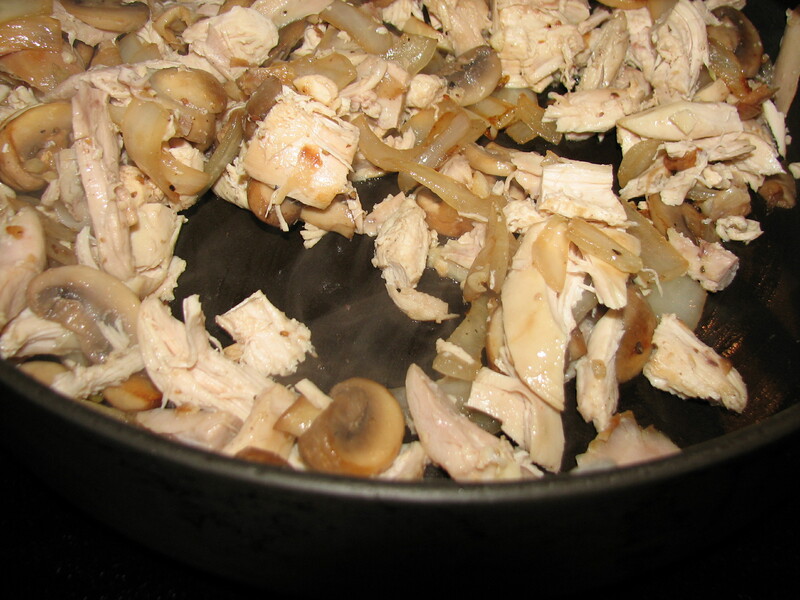 In a large skillet or sauté pan, heat up 2 tablespoons of olive oil. 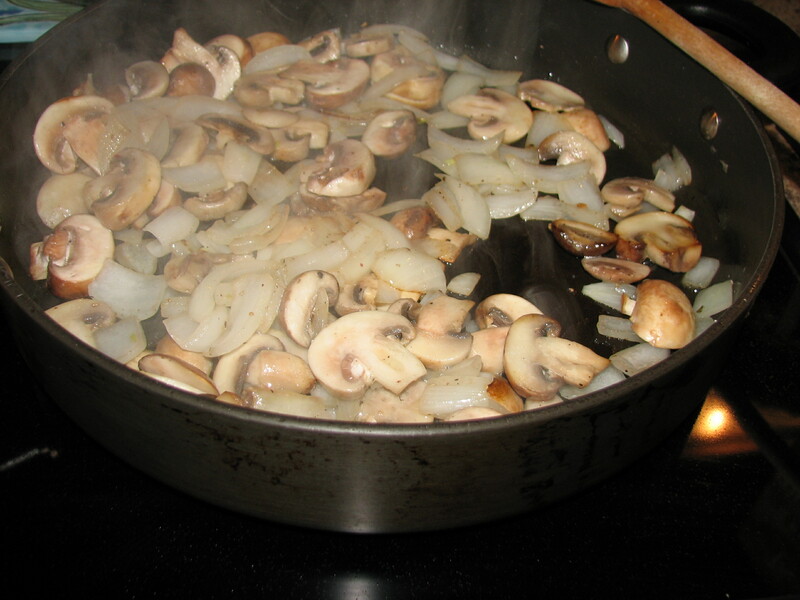 Add the onions, mushrooms and sauté for a good five minutes. Mushrooms will have a caramelized look. Add the garlic and sauté for a minute more. Add the chicken and sauté for two or three minutes allowing the cooked chicken to heat through. Add the flour to the mixture to create a roux and absorb all the liquid from the onions and mushrooms. Add the chicken and mushroom stock and continue to cook until the stock has thickened. Add the baby spinach and sauté for 2 minutes. The heat will wilt the spinach. 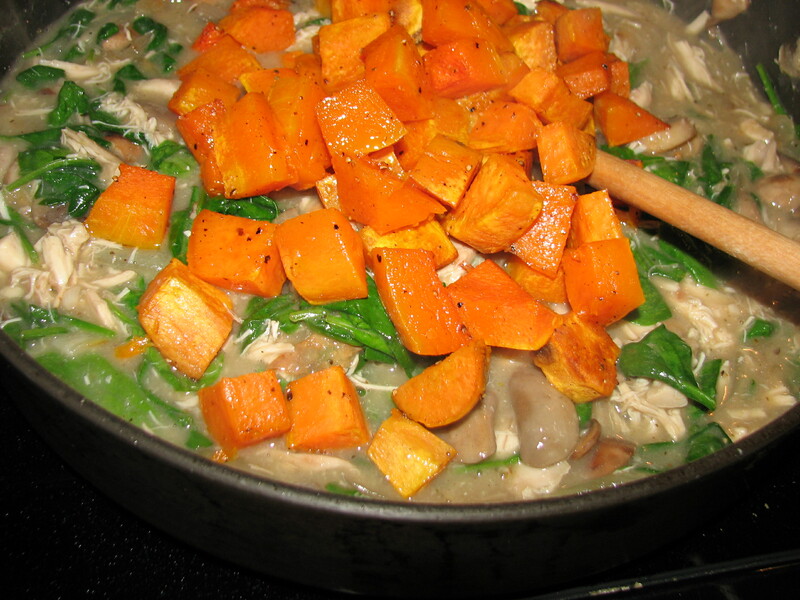 When done, add the roasted Sweet Potatoes and Butternut Squash and mix gently with rest of ingredients in the pan. Season the pot pie filling with kosher salt and cracked pepper to taste. 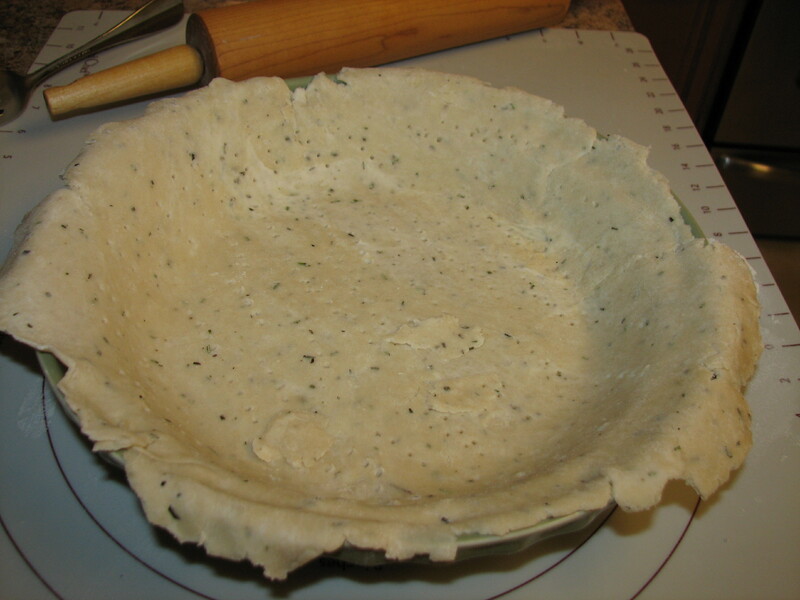 Roll out pie crust and line the pie plate with rosemary crust. Prick the crust with a fork. Pour the pot pie filling in the pie crust. Roll out the 2nd crust and cover the pot pie filling. 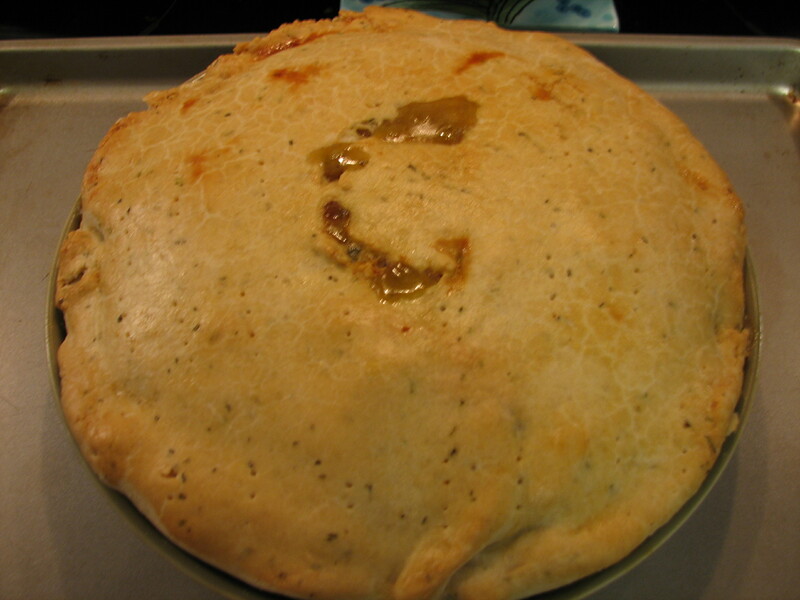 Roll the edge of the pie crust with your fingers underneath around the pie plate edge to give it a rustic look. Make a slit in the pie crust to allow the steam to escape. Crack an egg in a bowl add about 1 tablespoon of water and beat well. Brush the top of the pie crust with egg wash.
Bake for 30 to 40 minutes until golden brown and the filling seeps through the slit in the crust and bubbles. Let the pot pie sit for 10 minutes before serving.